The B2 pCVD Diamond Detector has a compact design with extra RF shielding and is completely RF tight. The detector can be used in vacuum. 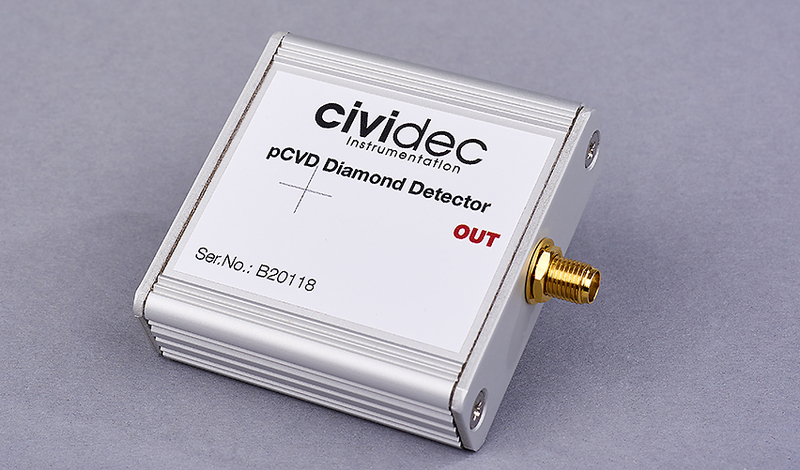 The pCVD Diamond Detector is typically used as a fast particle counter and for time-of-flight measurements. In combination with the C2-TCT Broadband Amplifier it is used for pulse-shape analysis of the ionisation current. In combination with the C6 Fast Charge Amplifier it is used for fast singe particle counting with 100% detection efficiency. In combination with the Cx-L Spectroscopic Shaping Amplifier it can be applied in vacuum and in a cryostat, as a 2 m long cable can be connected between the detector and the amplifier maintaining excellent signal-to-noise ratio.